It is difficult to explain the charm of this town Česky Krumlov. A walk through the historical center will open your eyes this beautiful old town. The cobblestone narrow streets and gorgeous little shops, supplying beautiful things at wonderful prices, and the ability to navigate this town on foot only enhances the experience. I have only been once, and will be visiting again this summer. The Krumlov Castle is a great medieval site, which remained untouched during the Second World War. You can visit the castle from 08:00 – 23:00. At night, Krumlov Castle is magical, with fewer people queuing to visit. After wandering through the courtyards, you can make your way to the castle gardens for more magnificent scenery of nature. From the top you can see amazing views of the entire town. The park stretches over a rectangular area of about 0.875 hectares surrounded by a wall. The garden is full of statues, flowers, beautifully trimmed hedges, and trees. Great for garden and nature lovers. Trdelník is a traditional Slovak cake and sweet pastry, originally from Hungarian-speaking part of Transylvania, Romania. It also is known within the culinary heritages of other European countries like Hungary. It is made from rolled dough wrapped around a stick, then grilled and topped with sugar and walnut mix. Nowadays, Trdelník is popular among tourists as a sweet pastry in the Czech Republic. Over the years Trdelnik has spread across the country, where it has become a popular and indispensable snack during festive occasions such as weddings or baptisms. Over time, the recipe has deviated from its original tradition. Yeast is added when preparing the dough and to give Trdelník its volume, fragility and the form in which we know it today – that is puff pastries. Would you like to try make it yourself? Here is the recipe. Great price for such a huge room with a massive 4-poster bed! Loved the style of the furniture, big bathroom and tub. I felt like I was back in the medieval times, living right by a castle with my prince next to me. You can hardly hear a sound from this hotel in the side street we were at. Easy to sleep with the windows open. Staff stay out of your way unless needed. It is a short walk form the hotel to the city. 200m to the Krumlov Castle. Since you will be out and about during your stay, make sure you have downloaded my GPS-guided travel article before you go. GPSmyCity offers amazing travel articles free of charge, so that you can read it wherever you are without having to connect to the internet. Isn’t that awesome? You can access GPS-guided travel articles two different ways, by either selecting a particular article of choice or browsing by city! It is the one and only guide you will need for your vacation. Try it out today! Czech people are the world’s heaviest consumers of beer. Czech people are mostly of Slavic descent, though some can also claim partial German ancestry, as a result of the country’s 1000 years within the Holy Roman Empire or Austrian Empire. There are over 2,000 castles, keeps, and castle ruins in the Czech Republic, one of the highest density in the world. The Czech Republic is the second richest Eastern European country after tiny Slovenia. The Czech Republic is almost entirely surrounded by mountains (except to the south, toward Austria and Slovakia). Mountains mark a natural border with Germany and Poland. 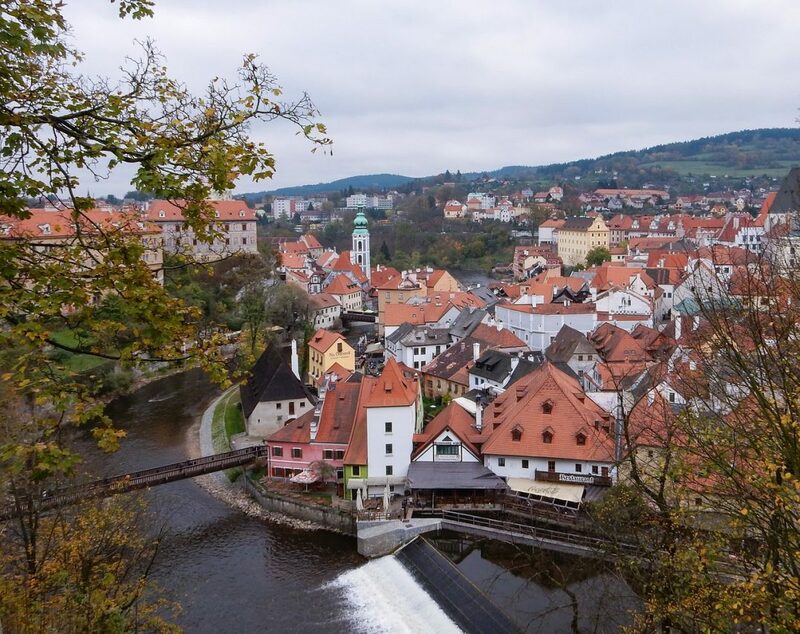 Have you been to Cesky Krumlov? If not, are you inspired to visit this charming town? Share your comments and feedback with me below. This is beautiful! I always wanted to travel this area of the world but my illness stopped me. Thanks for bringing it to me! Kumlov looks so gorgeous in all the pictures! I’ve never heard of this place before but I’d love to visit! Ooooh I want to go now. You mentioned prices twice in the cheaper more affordable term. It looks like a very nice place to visit. I’m always entertained with cobblestone. To see the castle would be fantastic too! Is this some place to you fly into a neighboring city and drive to? Hi Rose, we drove to Krumlov straight from Vienna. You could also fly into the Czech Republic’s capital, which is Prague, and then drive to Krumlov also. it is gorgeous and I hope you get to visit. A great write up about a place I had never heard of before. But the pictures sure seem amazing. Kinda like the GOT locations. WOuld put that on my list of things to do in Czech republic! There is lots to do here in Krumlov, and also in Prague. The Czech Republic offers so much fun and entertainment. What a cute place! Never heard of it before, but those pictures are so dreamy. As if from a movie. Thank you fro sharing your castle experience! Thanks to you, learnt about a sweet new destination today- Česky Krumlov!. The Slovak cake looks so good! It looks absolutely gorgeous! I would love to visit someday 🙂 I’ve been to Prague and it was beautiful! Wow, this small place looks like a dreamland. The castle gave me a feel to rush and unwind there in the lap of beautiful landscapes. It is so beautiful in Krumlov, but my favourite place in Europe is still Vienna, my home. Nice pictures! I like the Krumlov castle, this place is like a hidden gem in Europe. And I’m craving for some Trdelnik. They look yummy!!! I’ve never heard of this town before but it looks beautiful! I love learning about/visiting places that have a lot of history. I can’t believe that the Krumlov Castle survived the second world war. That is INSANE! Ah wow it looks lovely. The Czech Republic has never been on my radar of places to visit, but this has opened my eyes. Wow… first of all, the photos look like the one I would put up on travel magazines. They’re very beautiful and makes me wanna visit this place the soonest! The villa looks super coz too. I think you would love it there! I love Cesky Krumlov, the city was a gem for me. Oh wow! I’ve only been to the Czech Rebpublic once and have always wanted to go back.. this looks amazing! It’s stunning. I love the landscape. I want to try the food. This town looks amazing, your photos make me want to plan a trip right away! I’ve definitely got the travel bug! Such a beautiful part of Czech Republic! I kept seeing similarities to Karlovy Vary in your pics and my favourite movie Last Holiday. I also want to try that cake! OMG looks delish. How gorgeous! I never would have thought to visit Czech Republic, but your photos are making me want to go there right now! WOW, you are so very lucky to have visited such a beautiful place, I have never left the UK! This one is sure to go on the list. I hope to read more of your travels too. This is my next destination for my visit to Czech Republic, so far I have only been to Prague (Obviously) and to Brno. The scenery is breathtaking. I would love to visit this castle. It is like a fairytale. Beautiful ! What a wonderful experience to have. Who wouldn’t want to stay in a castle. Everything looks amazing, especially that yummy dessert. Beautiful. I would like to visit the castle at night. I would love to see the views at that time and I like that there are fewer people. Plus a castle at night sounds a little spooky and I like that. Oh man, you had me dying to visit just from that first picture! But then you told me about those Trdelniks and now I know that it’s a must I visit!! I think you would love it there Robin. In case you like to back, the recipe is in the post if you want to try. Villa Conti sounds like a wonderful place to stay, also the view is breathtaking around the city. Looks definitely like a hidden gem! Oh my Europe looks so beautiful wouldn’t mind traveling and sight seeing this lovely place with my Mom. This would be a wonderful place to explore. The Trdelník looks so delicious! I’d love some. I´ll save this insider tips maybe I can make it to visit in the future. Love those old style bed in the hotel where you stayed, as I love a bit antique and colonial style furniture. Thank you for sharing dear. Gorgeous place! I am adding it to my bucket list. How was the food? I’ve never even heard of this place until reading this post! Thanks for sharing this. What a beautiful place Česky Krumlov is and your pictures are stunning, the first one with the river curve really takes your breath away. Your hotel looks so cosy and that bed… so pretty. Wow what a beautiful place to visit.I would love to visit a real castle one day! This place is stunning! And your photography is breathtaking. I would love to visit there or someplace like it someday! Breathtaking pics. When I went to Vienna, I went to Prague and it was amazing. I miss tradelink so much and I have thought about making it here too. Next time, when I visit Europe again, I will make sure to squeeze in Gladys as a day trip. Gladys is the girl who commented above. LOOOOOL!!!!! Glad you liked the post Gladys. It really is a beautiful place to visit.